This is a photograph of the Theatre Royal, with its striking Art Deco facade and a Moorish inspired interior. 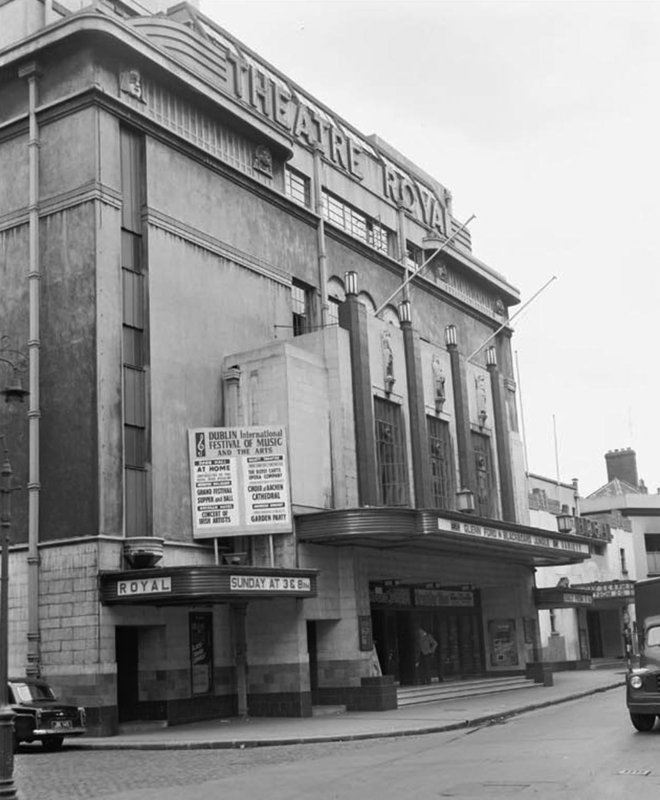 It was the largest cinema in Dublin, with an auditorium that housed 3,800 people. The International Festival of Music and the Arts is being advertised, and Blackboard Jungle is showing. The Royal had a resident 25-piece orchestra and its own dance troupe, the Royalettes. There was a Compton organ that came up out of the ground. Jimmy Campbell was the conductor. Tommy Dando and the Royalettes were a regular item; Alice del Garno and Babs de Monte; Bob Geldof’s mother worked as a cashier. Judy Garland played the Theatre Royal in 1951, wowing punters who couldn’t get tickets by singing from her dressing room window. And Danny Kaye was fondly remembered for many years by the taxi drivers of Dublin. He sang so many encores that everyone missed the last bus home.